The "Tiny Midi Rotary" is intended to be a basic building block for custom DIY midi controllers. I'am designing the "Tiny Midi rotary" to be a simple basic building block for custom DIY midi controllers but it can also be used as a LCD, Rotary knob driven controll unit for other projects or as a PIC16F877, PIC18F452 development, learning tool. The first proto type. It's a compact design, measuring 8.4 by 3.6 by 3 cm approx. The design is made up out of two small (8.4 by 3.6 cm) stacked PCB Boards. The bottom board contains a 40 pin DIP "Microchip" PIC18F452 micro processor, a Midi in and Midi out interface, a 6 pin ICSP (In Circuit Serial Programming) interface, a 40pin IDC conector for connections to the outside world, a 14pin connector for connection to the top board and a 7-12 volt DC to 5v DC power convertor. 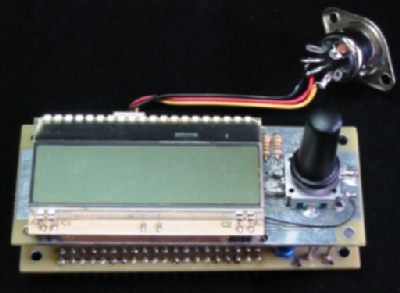 The top board houses an "Electronic Assembly" EA-DOGM162 2x16 character LCD display with backlight, a "bourns" Pec11 incremental rotary encoder with push button, the 14pin connector to the bottom board and an option for a extra switch or button and a Infrared Sensor for remote control. If you look at the PCB layout you can see that the processor board has an extra strip that contains the PCB mounted Midi connectors, a power switch and a DC power connector. If needed, this strip can be cut and the connections can be replaced by external wiring. To make the design as flexible as possible, all the I/O pins of the microprocessor are available at he 40 pin connector of the processor board. This opens the possibility to only use the processor board without the display board and use the I/O pins nomaly used for the display and rotary encoder for other purposes.